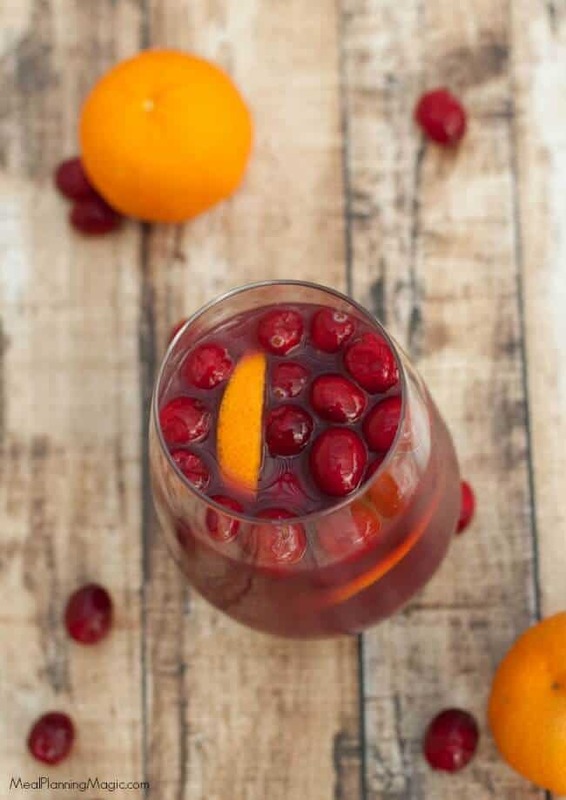 This Super Simple Cranberry Orange Sangria is just that—so simple! And delicious too. With only a few ingredients, it is easy to make ahead and serve any time of the year. 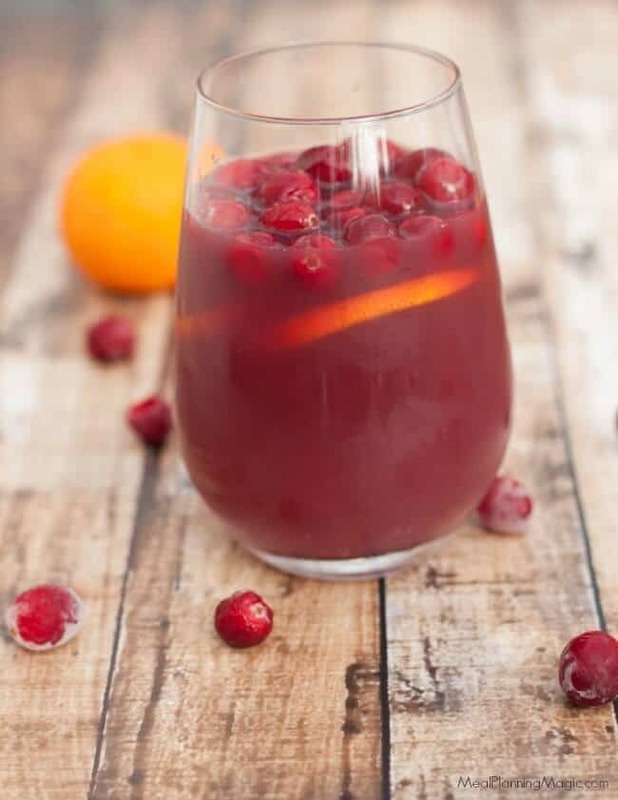 Click here to PIN this Simple Cranberry Orange Sangria to Pinterest! Before marrying my husband, I had never heard of sangria. That was more than a couple of decades ago and now it’s a staple at many family gatherings. My mother-in-law is Spanish and she’s been making it when we get together for as long as I can remember. She’ll tell you that the biggest mistake people make with homemade sangria is using an expensive wine. Sangria is the time to use the cheap wine! I can remember for one gathering at the lake, she make the sangria using what seemed like a two gallon bottle of red wine. I had never seen a bottle that big! There are all different variations to sangria but the most common uses red wine. Last year, she made a delicious version with some cranberry juice she had on hand and voila! Simple Cranberry Orange Sangria was born. With only three ingredients, you can make this quickly for all kind of get togethers with family and friends. Long ago, my mother-in-law would make sangria with a juice blend called “Five Alive” but that’s no longer available (at least not in the US). The original Citrus version was a juice blend of orange, lemon, grapefruit, tangerine and lime juices. So now it’s usually just what she has on hand. I think the addition lemonade would also be good in this sangria. 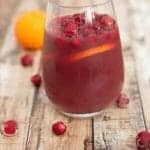 The great thing about this Simple Cranberry Orange Sangria is that you can literally make it in minutes! Just have the ingredients on hand and pour them all in a pitcher just before serving. So easy for entertaining during the busy holiday season or any time of year. Grab some fresh oranges or lemons—or both-to slice up and top each glass with a slice of either and some cranberries for a more festive touch. This Simple Cranberry Citrus Sangria is just that—so simple! And delicious too. With only a few ingredients, it is easy to make ahead and serve any time of the year. In a large pitcher, beverage dispenser or punch bowl, combine wine, cranberry juice and orange juice. Serve in glass topped with fruit as garnish. Buy the cheapest red wine you can find--it doesn't need to be fancy! If you want to prep ahead to make serving time easier, chill all the juices and wine ahead of time so that all you need to do is blend them together. If you’d like a non-alcoholic punch alternative for your holiday gatherings, be sure to check out my Sparkling Pomegranate Citrus Punch. « Sparkling Holiday Citrus Pomegranate Punch – Only 4 Ingredients!